Google Play Giftcards land in the UK: Available at Morrisons and Tesco! 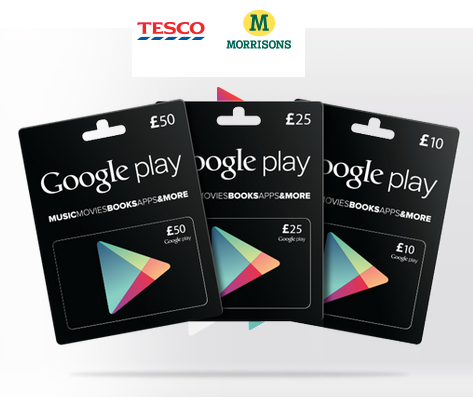 Today Google has officially announced that gift cards for the Play Store are available and they've teamed up with Tesco and Morrisons to offer the cards initially. At the moment if you have a look at outlets which have the cards available, there's a nifty little checker here, then you may notice that your local supermarket won't have them available right from the off, instead the places stocking the gift cards will grow 'over the coming weeks' until 'all UK branches of Tesco and Morrisons' have them! Google is currently offering the cards with three different amounts of credit on board, there are £10, £25 and £50 options available! There's nothing too high tech here, you basically scratch off the label to reveal a code, and from there you type the code in on the Android or web version of the Play Store and there you have it! The vouchers can be spent on anything apart from hardware in the store, which shouldn't be too much of a problem, if relatives know you want a device just remind them that the cards won't be an option! We don't have any word on whether Asda, Sainsburys, Waitrose, Spar or One Stop will start issuing these yet, but where Tesco and Morrisons lead we would expect at least Asda and Sainsbury's to follow soon after! We're pleased to announce that Google Play gift cards will be available in the UK from today [Wednesday, March 6 2013]. Gift cards make it even easier to buy apps, games, books, movies, music and magazines from Google Play, Google's one-stop-shop for all your digital entertainment needs. Over the coming weeks, gift cards will go on sale in all UK branches of Tesco and Morrisons. With Google Play, you can buy books, apps, games and music, and rent or buy movies, on the device of your choice – be it a computer, Android phone or tablet. All of this entertainment is available across multiple devices – buy a book on the web, for example, and it's instantly available on your phone or tablet. And now users can pay via Google Wallet or by redeeming a Google Play gift card."